When we last left you, we had discussed two oral cancer screening options. This week, we would like to discuss what some of the early warning signs of oral cancer are. It is important to remember that oral cancer is easily treatable when caught in the early stages. Over 42,000 people were expected to be diagnosed with oral cancer in 2017,According to the Oral Cancer Foundation. The best way to detect oral cancer is through screenings, but there are some signs you should look for. Having one of these symptoms does not necessarily mean that you have oral cancer, but they should not be ignored or left untreated. It is important to be aware of common signs that may be linked to oral cancer. The earlier it is detected, the better the chance of curing it. 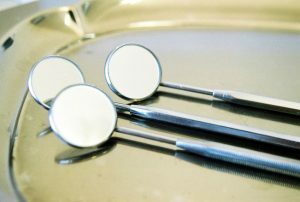 If these issues do not go away after two weeks be sure to schedule an appointment with your dentist as soon as you can. For more information on oral health, be sure to visit the American Dental Association’s website. Dr. Van Treese offers head, neck and oral screening tests at his practice in Sidney, OH. If you have never been tested or would like to just make sure everything is okay, be sure to schedule an appointment today.